Home Builders grow your business with a new website design. So, what are the 2new home building styles? New Traditional, Soft Contemporary, Transitional, Santa Barbara - these are new trends in home building people are talking about. It's different across the country. Here in Texas, Tuscan and Mediterranean still reign because they continue to match the climate, terrain and the lifestyle. 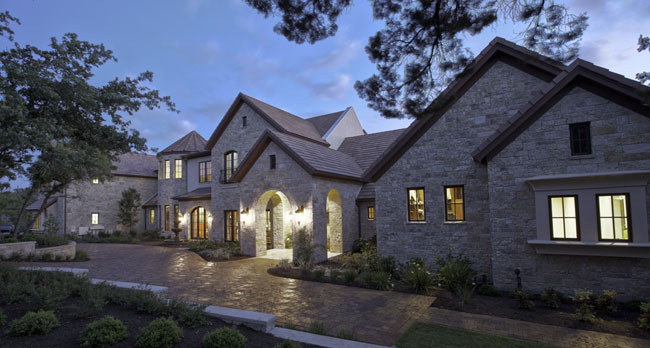 Stone, stucco and year-round water features are here to stay, whatever the style. Craftsman will always have an appeal in the Pacific Northwest. In Virginia, Maryland or Delaware various shades of Palladian, if done right, always look great and hold up over time. Small size of the website - your website should be 1600 pixels wide. Most new websites are this size today. Little pictures - years ago we used to worry about picture sizes because of load time. Now everyone has high-speed access to the web. Big beautiful pictures are critical to the success of your site. You must have great, wonderful slide shows with them. No strong, clear marketing messages - telling the story of your company is essential. It's always the same stuff - who you are, what you do, where you do it, and why a potential customer should pick you. Unsophisticated or dated design - if you are a home builder - in the business of contemporary style, modern construction and innovative building products - your website needs to be the same - contemporary, modern and innovative. Your website is not adaptive - this means your site does not automatically resize itself to the type of device you are using, It should auto-fit on smart phones, tablets, notebooks - whatever you potential customers use. Tablets are everywhere now, everybody seems to have an iPad. Elements in your site don't display because they are in Flash. iPads and Apple devices haven't been able to display Flash elements for years. Convert them as fast as you can to something that works. If it's time to update your Home builder website, give us a call for a review and consultation on your existing site. We can redesign and reprogram your site in as little as three weeks. We have years of experience with home builders, interior designers and suppliers. We know how to get you on top of search engines, too. Pallasart can update or refresh your logo, too. Our web design and programming services are priced competitively.